No more “lobster-cide”; I can’t kill lobsters anymore. Being a chef, and an instructor who used to be able to teach such things to poor unsuspecting students, this isn’t something you’d admit out loud. I was reading Domestic Diva MD‘s post on having to cut up a chicken and kind of understood what she was crying about. I can butcher chicken and birds quite well, it doesn’t bother me at all. Suppose that is because they are dead when they arrive on my cutting board. They flicker their feelers at you, roll their odd eyes and foam at the mouth for desire to be back in the water. They try to walk around so you have to watch them or put them where they can’t get away.They often pack fresh seaweed with them so they have something familiar on their death ride besides a waxed box with ice. That is most likely not the reason, but it is my guess for now. In order to kill them correctly, you need to rub them between the eyes to calm them down and ‘put them to sleep’ before plunging a 12″ razor-sharp knife into their brains. Has he ever been a lobster? How does he know? I can’t do that anymore. I am bothered by being able to do it in the first place. Once they are dead, no problem, just can’t kill them. The last time I had to kill lobsters was for a dinner party I was doing for a friend in Atlanta. 14 lobsters for the appetizer. 14 live and kicking lobsters. I could hear them scratching around inside the box, slightly muffled by the seaweed packed in the box with them. I placed them in the kitchen sink. I got creeped out by so many large weird leggy things scrambling around in the sink, I had to put some of them back in the box. Rubbing the space between the eyes, they calm down. Ready, Aim, Plunge and split the thing in two. OH! How it writhes and wiggles after! After forcing myself to do all 14, I was a total basket case. Crying, kneeling down begging forgiveness for taking their lives, who was I after all to decide it was their time to die? It was quite a horrible struggle emotionally and morally. I won’t kill lobsters anymore. Not that way. If necessary, I’ll put them into a perforated hotel pan and pop them into a fully active steamer and slam the door shut for 8 minutes. When I return, voila! Lobster meat. 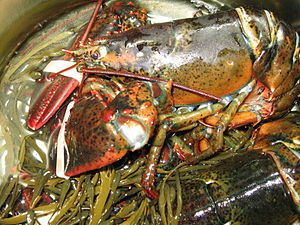 The shells have turned red and there lies the perfect ready to eat lobster, after you rip off its tail and claws. Melt some butter and Bon Apetit! Just don’t ask me to kill them anymore. 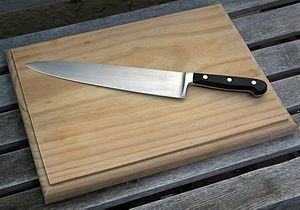 This entry was posted in Cooking Thoughts, Recipes, Teaching Culinary School, The Life of a Chef and tagged domestic diva, Eric Ripert, Fish and Seafood, food, Lobster, unsuspecting students. Bookmark the permalink. Reading your post about chicken reminded me of this lobster-cide. 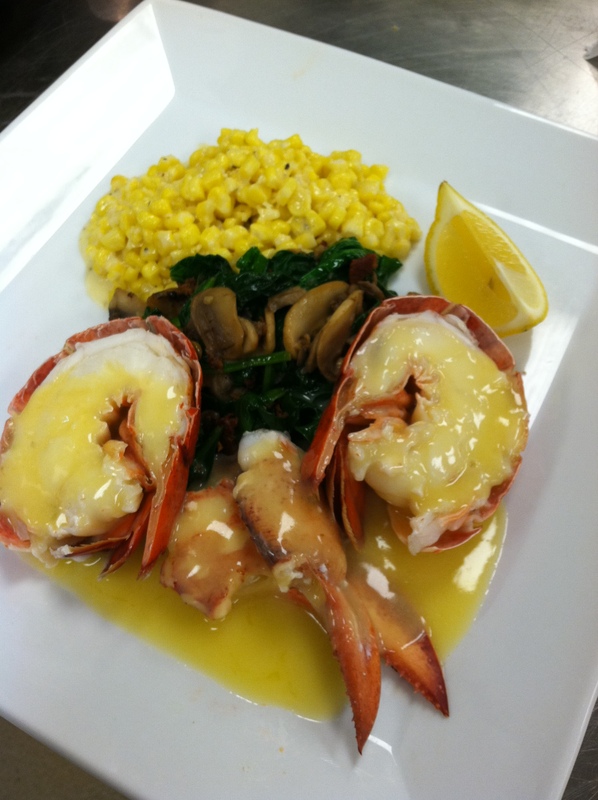 My best advice is if you are squeamish about chicken, get your lobster ready to eat. Thank you Heather. I agree, there needs to be more respect for what we are cooking and where it comes from. When it comes to meat, no matter whether we killed it or not, the respect for the animal needs to be there. Always. I love eating meat, but have great respect for where it comes from and how it ended up in front of me. It is hard to kill them but so easy to eat! There are definitely two schools on this issue, those that can and those that can’t. I migrated from one side to the other. I’m just glad we don’t have to get all our food by killing it ourselves. Love the writing and how you weave in practicality in so many of these along with life lessons. Very cool! holy c… the finished dish looked like something I would order at a fancy restaurant. and would definitely love it if you were the cook. but don’t ask me to kill a lobster. I am a carnivore hypocrite. ps: sorry for disappearing, as usual, too much work. but I am back now. Thanks Barbara! Glad to see you and so glad you are back! Carnivore hypocrite is a good descriptor. While I love to eat meat, I am also glad and grateful there are those who can do the slaughter for us.